Halloween is a few days away. Are you prepared?! Do you have goblins, ghosts, and Goobers all ready to go? Or witches, bats, and Kit Kats? If you don’t, I suggest you get on that. I got my supply of chocolate candy from the good people over at FreshDirect, along with the rest of my ingredients, and I’m participating in their virtual Trick or Treat with some of my favorite Instagram friends (aka “Instafriends”). I never use all of my Halloween candy for the kids anyway; mostly because I don’t have any and I live in Williamsburg, so if you’ve seen halloweenorwilliamsburg.com, you know what I mean. It’s just confusing. But I digress. 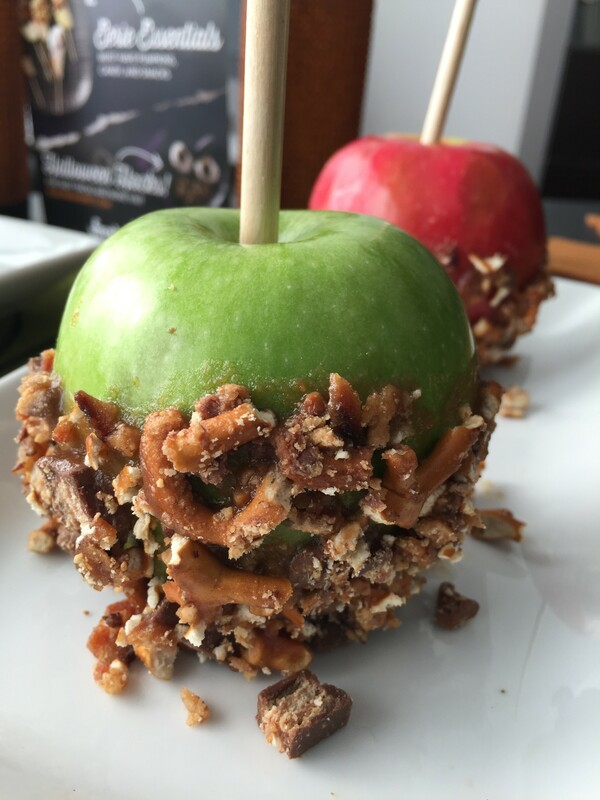 So instead, I made some caramel apples and stepped it up a few notches with bacon, Reese’s Peanut Butter cups, Kit Kats, and crushed pretzels. Even the caramel has a couple tablespoons of PB in it. MmmMmmMm spooky. Ok it’s not spooky but it’s really good. 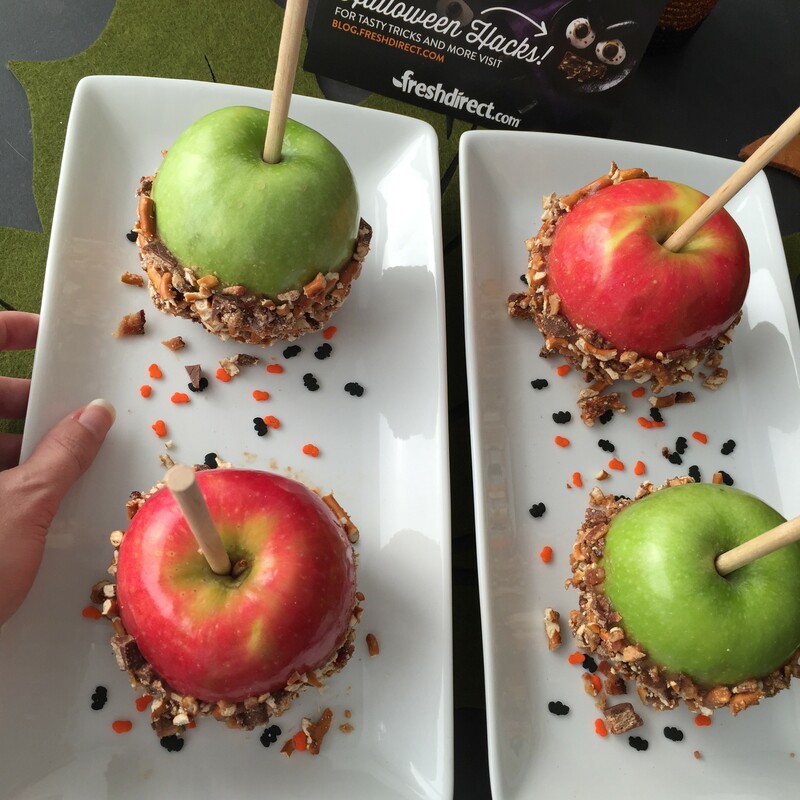 I see caramel apples every fall. They’re kind of everywhere, but I never buy them because they’re too hard to eat. In my opinion, you need the jaws of life to bite through them or you need a knife. So here’s my solution: make them at home and eat with a knife. So simple. 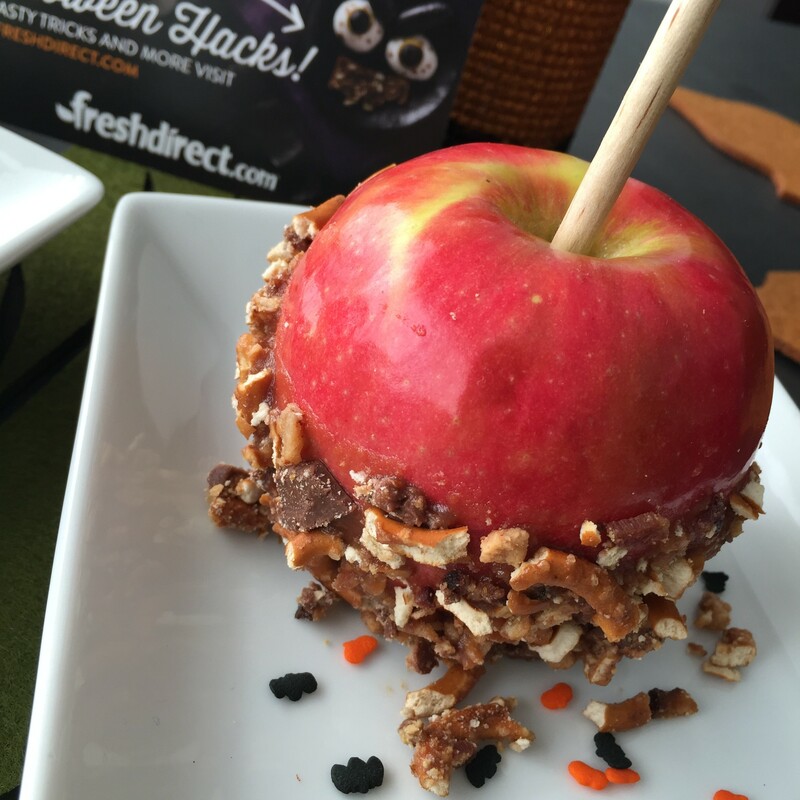 Here’s another pro tip – if you sand down the apples a little with sandpaper, the caramel sticks better. I learned that a couple years ago whilst apple picking. Who knew? Cook your bacon til crispy. Drain on paper towels and chop/crumble into small bits. Crush the pretzels! I put them in a Ziploc bag and hit with the back of a heavy spoon. I also didn’t have a Ziploc bag at the time, so I used a makeshift Saran wrap bag. This doesn’t really work and isn’t a good idea, FYI. 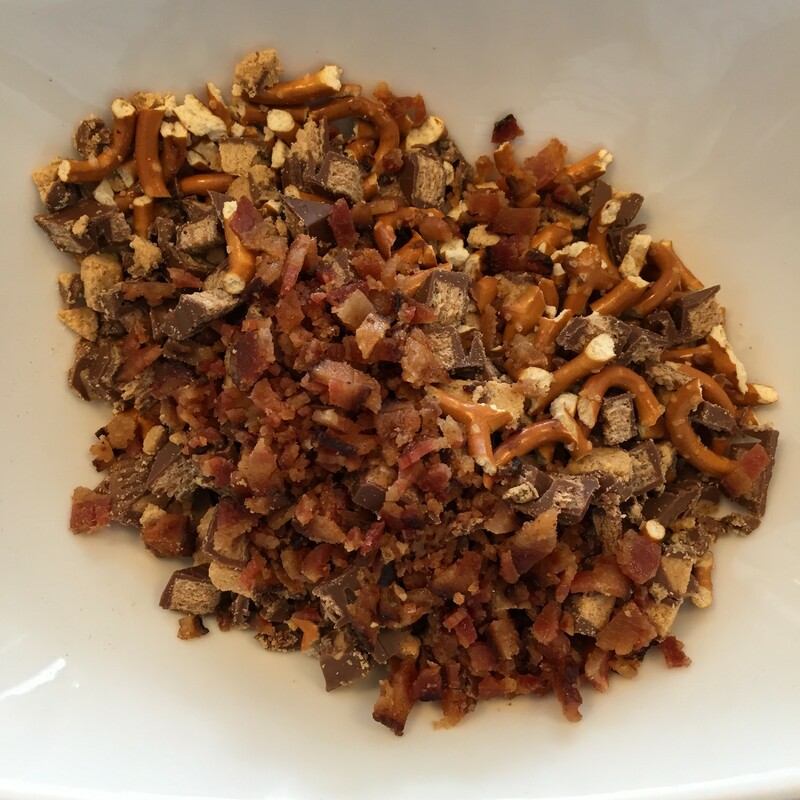 Combine candy, bacon, and pretzels in a shallow bowl or pan and set aside for later. Push a wooden stick into the top of each apple. This takes more elbow grease than I’d like to admit. Or I’m just weak. Make the caramel. BE CAREFUL. 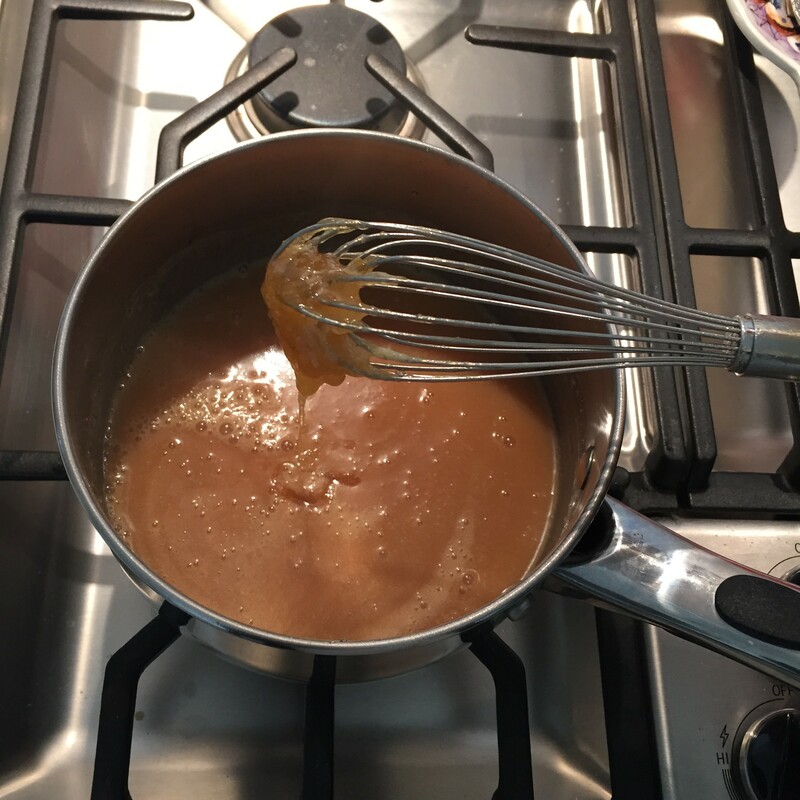 Not to scare you (even though it is Halloween), but making caramel can be a little tricky because sugar burns are very real. And when the sugar is boiling, and you add cream to it (or any liquid really), it will bubble up very fast and you have to be careful. Wear oven mitts, and cover your arms just in case it spatters a little. 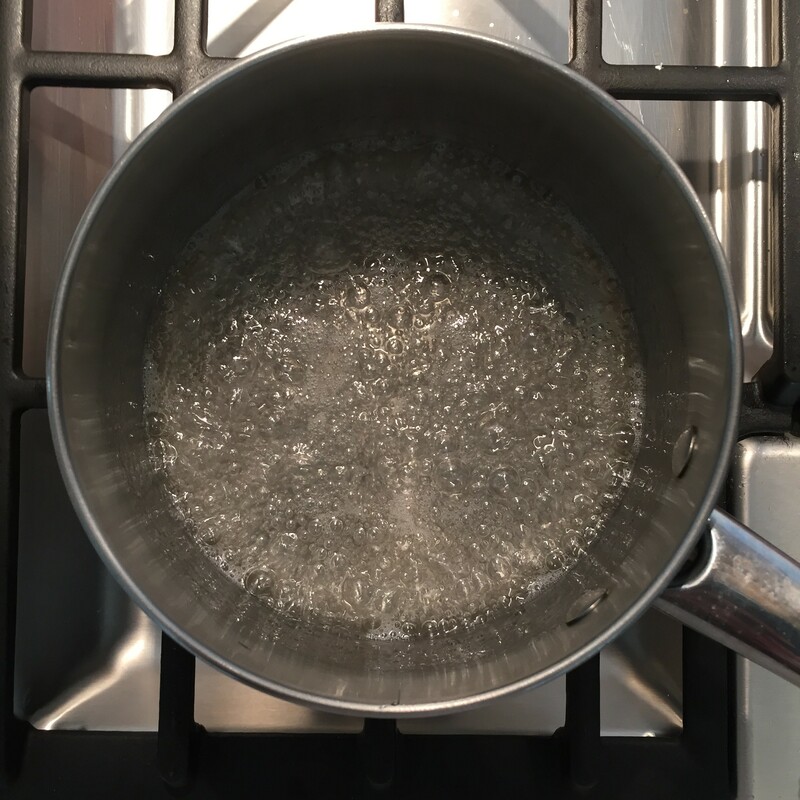 Add the sugar, water, and corn syrup into a medium sauce pot and bring to a boil over medium-high heat, stir pretty constantly until the sugar dissolves. 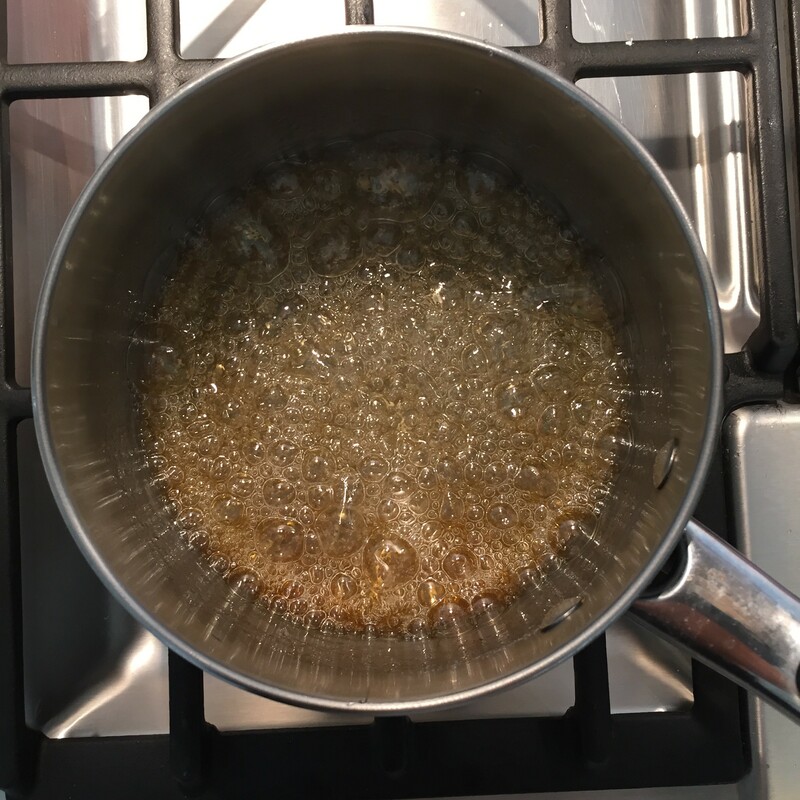 Once sugar is dissolved, let it boil a little until it turns a light amber/gold color. This means you are ready for the scary part! Remove from heat to a different burner. Slowly add in the butter and cream, and like I said, this will bubble up on you and look all angry. But it will be fine, and it will simmer down. If you get clumps, don’t worry that happened to me too a little, just keep stirring. Return to a low heat and add in the salt, vanilla, and PB (if desired). Stir for a couple minutes to make sure it’s smooth and clump-free, and then remove from heat. 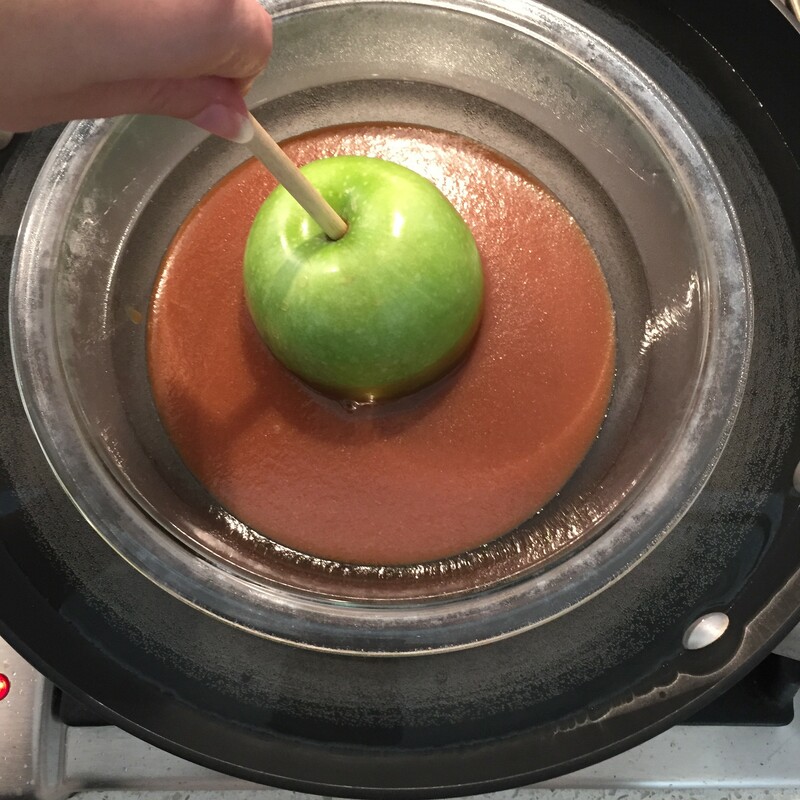 Pour caramel into a glass bowl and dip your apples! This is a matter of preference, but I like them only halfway covered. 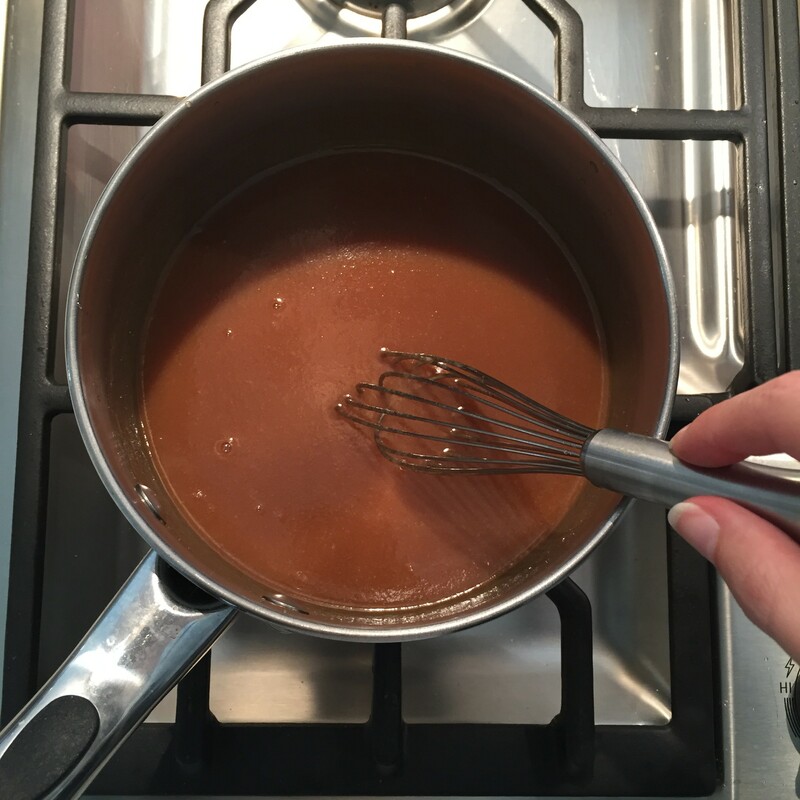 Keep in mind this caramel doesn’t set as fast as some others do, so be patient with it. I had to double dip mine to get the desired coating. 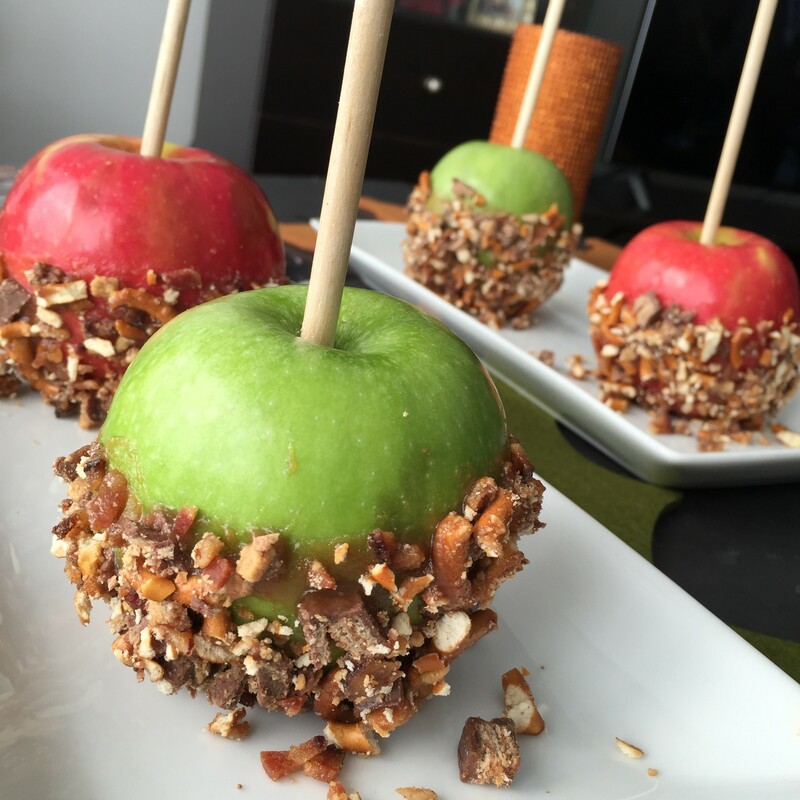 Roll the caramel apples in the crushed candy, bacon, and pretzels. Set on parchment paper to chill and can even pop in the fridge. ENJOY! Use a knife. Your teeth will thank you.